Love it or hate it, Valentines Day is approaching and for those of you who love it, it's the perfect time to get shopping for your other half or even just some bits for yourself *guilty* I am just in love with all things heart shaped and with pink and red being my favourite colours it makes perfect sense to make the most of Valentines Day! For those of you who hate it, I'd probably avoid this post and the others I am posting this week as they have a bit of a theme running through them all. I have loved Valentines Day for ageeees, single or in a relationship I still love it! There is something about spreading love and sharing happiness which warms my heart, okay I'll stop being mushy now and move on to the post. Which for those of you who haven't guessed, today is going to be a Valentines Day haul from Paperchase. From cards to candles and everything in between Paperchase have you covered, if you need some inspo or LOVE Valentines Day like me, keep reading! First off I'd start with the 'cheekier' presents that you can purchase from different types of game books to chilli pens Paperchase, basically have it nailed *excuse the pun*. The book which is called 'Why you're so hot' is a personal gift to give to your other half where you fill in the gaps and then give it to them, I like gifts of this sort as it shows more feelings and that effort has gone in. The Chilli pen made me laugh because it's just so fab, and a pen which is able to be used all year round. Although sitting in a meeting you may get some funny looks writing with a pen. As far as the game book is concerned, it made me laugh a lot and I wouldn't try anything from it personally, but if you are the adventurous type, why the heck not! 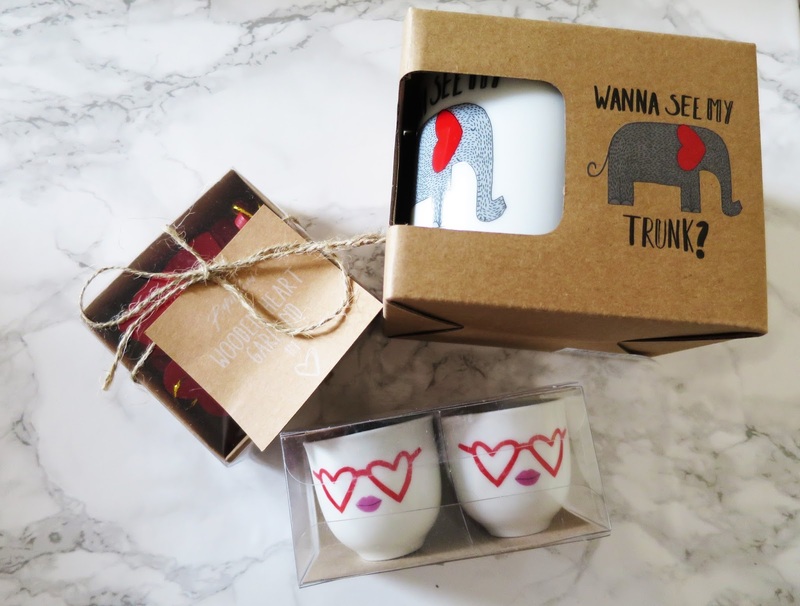 The next lot of goodies I am calling the 'cute' section, which essentially is everywhere in the run up to Valentines Day although I think Paperchase have it down to a T, from the adorable egg cups with heart eyes, to a sting of beautiful hearts to stick somewhere in your house, to the amazingly adorable and hilarious pun mug, gotta admit you laughed a little at the 'wanna see my trunk?' pun right? I am in love with everything from this section and will use it well after Valentines Day. Following this I grouped everything together which fitted within the theme of lips, as you can probably see. I love these goodies because they're all pink and pretty and super girly like me. 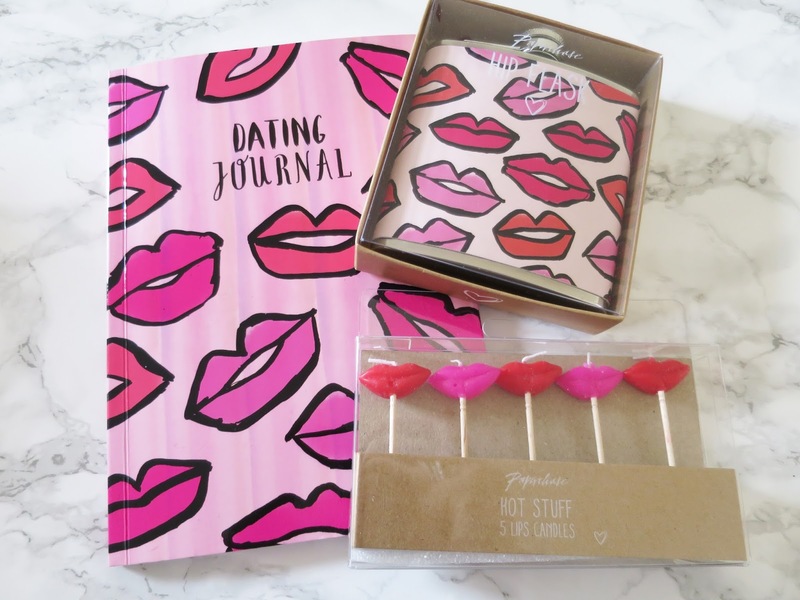 The dating journal is so fun and similar to ones I've had in the past like listography but I like the fact it is more fun and has some awesome puns throughout. On to the flask, although the chances are I won't use this I am sure I can find a friend who will, with the same adorable print as on the book this makes me super happy. Finally the candles are SO cute and perfect if you plan on baking for your other half as it adds an extra element of fun to it. Finally the cards, of course cards are important they are the KEY to completing the perfect Valentines Day gift, I love the huuuuuge range of cards Paperchase offer and there is one to suit everyone. From puns, to jokes the cards are some of my favourite and they have a massive range of prices for their cards as well as their designs. I can't fault the Butter Me Up card as those eyes kinda melted my heart, and the card with the bum joke on reminds me of my boyfriend so it's a win win. 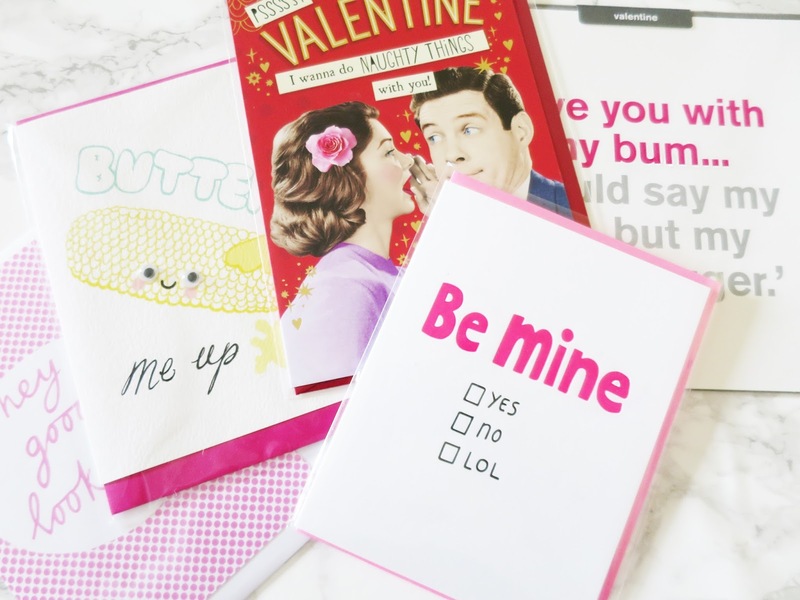 I think Paperchase have done amazing with this years selection of Valentines Day goodies, what are your thoughts?